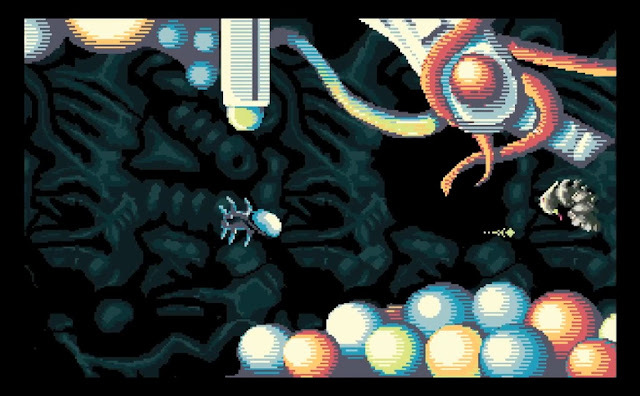 Indie Retro News: Inviyya - In development Amiga Shoot Em Up gets its first demo! Inviyya - In development Amiga Shoot Em Up gets its first demo! We've been banging on about this game month after month, and finally after all this time we've just been contacted by Zbigniew 'Saberman' Zieliński, that Steril707's in development Shoot Em Up ' Inviyya ' has been teased with a final version of the Revision 2018 Amiga demo! Yes indeed a game that started its life with a first announcement via the EAB forums in October 2016 is ready for your clicky joystick to get in on the action. Be aware this is the first demo version available and it is still from a work in progress game requiring at least an Amiga 500 with 1mb of ram. But putting that aside a number of enhances and fixes have been added over from the Revision version, such as a title screen, much better collision detection with enemy bullets, one more enemy type and a mid level boss fight included. So if you want to try out this rather cool looking shoot em up give it a go!